I have finally hit on a recipe using squash that my kids love! They both have a super sense that can sniff it out anywhere I try to sneak it in — so this time I didn’t even pretend. I straight up told them it was in there, and they’d have to at least taste it. Well they gobbled it up! Eureka! Lots of the cook time is unattended baking. To make this vegetarian, substitute a can of your favorite beans for the ground beef. I particularly like to serve this topped with a simple cilantro slaw. See recipe below! Preheat oven to 350˚. Prick the squash all over with a paring or steak knife. Place in the microwave and microwave on high for about 5 minutes, turn it over and microwave another 3-6 minutes, until completely tender. All microwaves vary greatly in strength, so use your judgment on the timing here — you can always do 1-2 minutes at a time and just keep checking to see when it’s tender. Cut the squash in half and remove the seeds, discard. Then using the tines of a fork, scrape the spaghetti strands out of the squash. Spray a 2-quart casserole with some cooking oil, then press the spaghetti squash into the bottom and up the sides of the casserole. Place in oven to dry the squash and firm it up a bit while you prep the rest of the dish. Heat oil in a large skillet. Sauté onions and pepper with a pinch of salt and pepper until tender and starting to brown, about 8-10 minutes. Stir in garlic and ground beef or beans and sauté, breaking up clumps of meat with a spoon, until no longer pink. Sprinkle with taco seasoning and flour and stir to incorporate. Stir in juicy salsa and simmer until thickened, about 5 minutes. Taste and adjust seasoning. 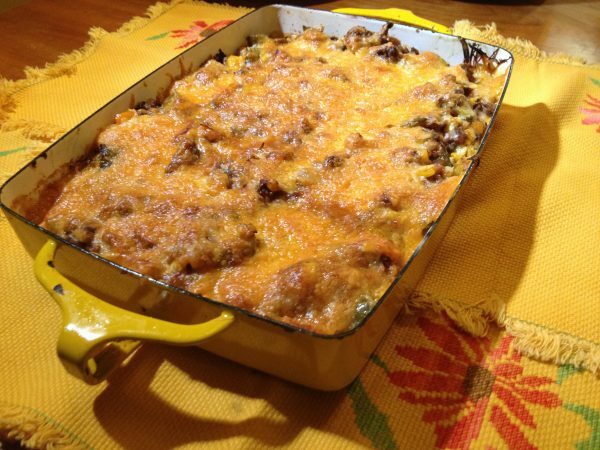 Pull casserole with squash out of oven. Smear 1/2 cup sour cream on top of squash. Pour in beef mixture, top with cheese and return to oven until golden brown on top. Serve piping hot. Juicy Salsa recipe is here. And the Cilantro Slaw recipe is here!